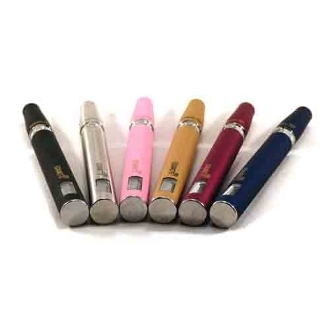 Electronic cigarette mega ego battery uses a 1100mAh manual switch with lcd display. The mega ego battery w/LCD is compatible with all 510 atomizers, ego tank atomizers, cartomizers and clearomizers. To charge the ego battery, screw the top of the battery into the mouth of the USB charger. The first night, make sure to charge the batteries for 8 hours, as to set the batteries’ charging memory. After the initial 8 hour charge, you must only charge the battery until the light on the usb charger goes from red to green. It takes about 2-3 hours to charge depending on how much battery life was on there to begin with. The light on the ego battery will cycle through several colors as it charges. You want to make sure that you don’t fall asleep and leave it charging for 5-10+ hours every night. If you overcharge your ego battery, you run the risk of blowing your battery, leaving it unable to function and also voiding the 30 day warranty. When the ego battery is fully charged, the light will be green. As you use it, the color will change to blue, then to red to indicate that the charge is low.